There’s kind of a running theme going on with Play Arts Kai’s Marvel variant toys—they look great, but they lack the sort of delightful insanity the company’s DC output has. Venom continues that trend, but at least he looks kind of badass while doing so. This sort of quasi-armored look Venom is a bit of a change from the black organic mass of the comics, but it looks cool—and actually matches up with the sort of aesthetic the Play Arts Kai Spider-Man has. And the dark purple highlights looks swanky too, in a sort of mid-90’s way. The coolest part of this Venom figure though is all the swappable parts. A standard smiling head and fists can be replaced with an awesome, tongue-wagging alternative head and a variety of hand sculpts that vary from being claw-like to spraying out tendrils of Venom-gloop. The gloop hands look great, especially as it’s not a Spidey-esque spray of webbing but the actual hands and fingers transforming—this figure could pull off some pretty spectacular “Jazz Hand” poses. 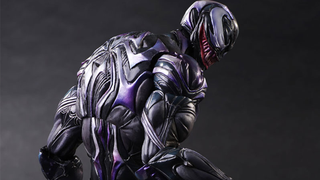 Venom will be out in October in Japan, and like the past Marvel figures he carries a bit of a Marvel-Tax compared to other Play Arts Kai toys: He’ll set you back around 13,000 Yen, or $105.